Sedona MapINFO: Sedona is a city that straddles the county line between Coconino and Yavapai counties in the northern Verde Valley region of the U.S. state of Arizona. STORY: After our helicopter adventure we left the Grand Canyon national park and started our descend back to our start point in Arizona, Phoenix. We had planned to make a quick visit in Sedona and refuel our car and stomachs as well. 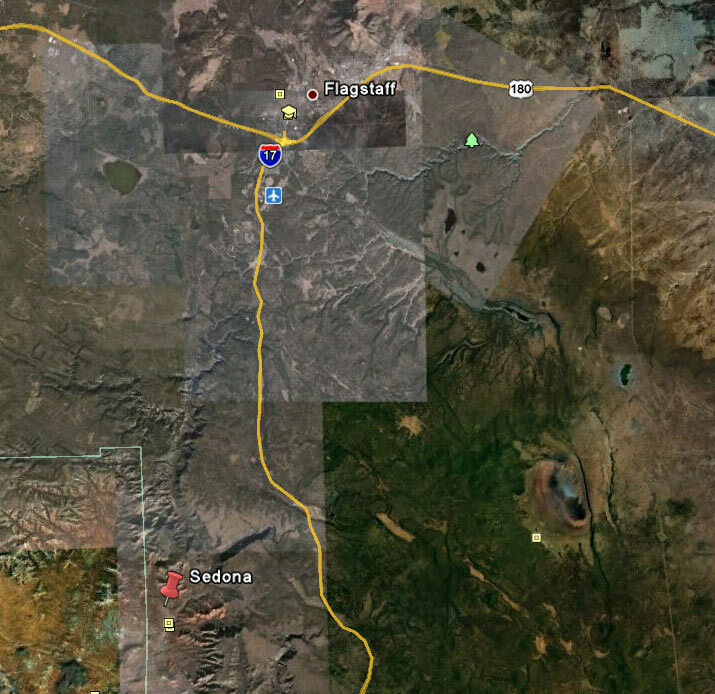 First we had to drive for more then one hour to reach Flagstaff, and then change direction to Sedona. We didn’t expect to see so very much vegetation on this part of the trip since we where on a similar road from Phoenix to Flagstaff. Flagstaff is situated about 2000 meter over sea level, and to reach Sedona we had to drive on a really small and speed reduced serpentine road. 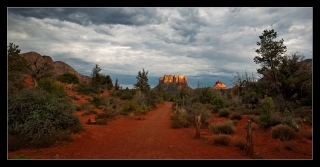 It was really interesting to see how vegetation and landscape gradually changed the closer we got to Sedona. In the area we saw a little stream which supplied the whole area with water, making the vegetation and forest flourish. We passed a few view points on our descend, but due to plenty of cars in front and behind, we decided not to stop. Sedona was a little and beautiful town located in a valley between big and reddish sandstone formations, well known as Red Rocks of Sedona. The formations appear to glow in brilliant orange and red when illuminated by the rising or setting sun. The Red Rocks present a breathtaking backdrop for everything from spiritual pursuits to the hundreds of hiking and mountain biking trails. We parked our car with intention to find some refreshment and recharge our power. It was much colder than we expected, probably 5-10 Celsius less, but still hot enough… around 35 C (95F). It was late afternoon and we still had a lot off car driving to do and this made our stay quite short. We found a store with beautiful handmade Indian crafts and we bought a few silver and stone combined jewelry. On the way back just a few kilometer outside town, we made a stop on the first view point and Itook a few shots.